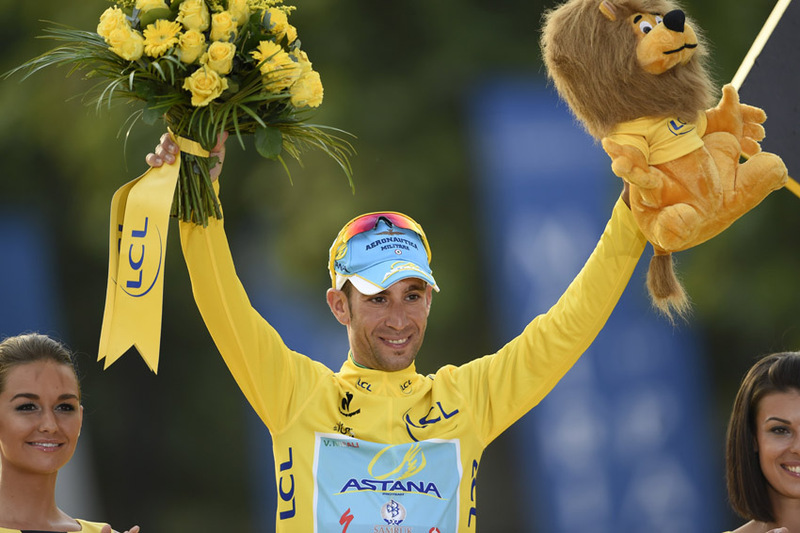 Vincenzo Nibali (Astana) sealed overall victory in the 2014 Tour de France in Paris, to join a group of six elite riders to have won all three Grand Tours, as Marcel Kittel won the final stage in a sprint on the Champs Elysées. The Italian had all-but won the race after Saturday’s time trial, and crossed the line safely with his Astana team-mates in Paris, as Jean-Christophe Peraud (Ag2r) and Thibaut Pinot (FDJ) completed the final podium. For the second year running, Marcel Kittel (Giant-Shimano) won the bunch sprint in front of the Arc de Triomphe, ahead of Alexander Kristoff in second and Ramunas Navardauskas (Garmin-Sharp) in third. Giant-Shimano hit the front early and were leading into the final corner, but it was Kristoff who moved clear with 100m to go. However, Kittel kicked again to close the gap and win on the line by half a wheel ahead of the Norwegian, for his fourth stage win of the Tour to equal his victory haul from last year. André Greipel left his attack too late, and could only finish in fourth. At the start of the day, the peloton left Evry in a celebratory mood, as has become tradition at the Tour. Nibali led out the bunch with the four jersey winners — Peter Sagan in the green jersey, Rafal Majka in the King of the Mountains polka dot and Thibaut Pinot the best young rider in the white — alongside him. The riders then enjoyed a relaxed ride, sipping champagne and chatting as they made their way towards the French capital. However, as the Eifel Tower came into view and the peloton hit the Champs-Elysees with 56km to go for the first of eight 7km laps, the racing proper began. Astana led as Sylvain Chavanel (IAM Cycling) made the first attack of the day, followed by Jens Voigt, participating in his 17th and final Tour who made his farewell with a spell out front. A three-man break then formed, featuring Sky’s Richie Porte, Jose Serpa (Lampre-Merida) and Michael Morkov (Tinkoff-Saxo), however they never got a gap above around 26 seconds. Richie Porte was the last survivor, but was swept up with 7.5km to go for the bunch sprint. Nibali, 29, ended the race with a winning margin of 7-52 over Peraud, with Pinot a further 32 seconds behind, to add the Tour de France to his victories in the Giro d’Italia and Vuelta a Espana. France could also celebrate a wholly successful Tour with two French riders on the podium, as well as Romain Bardet (Ag2r) also in the overall top 10. The last time a Frenchman finished on the podium was Richard Virenque in 1997. Nibali, wearing matching yellow shorts to his jersey for the first time in the race, crossed the line and hugged his wife and daughter as he became the seventh Italian to win Tour, and the curtain on the 2014 race came down.